Deep in the Universe, Hubble captured a stunning but turbulent scene with its Advance Camera for Surveys. 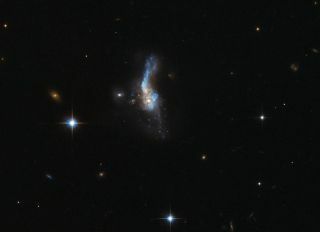 An ultralumiunous infrared galaxy known as IRAS 14348-1447 over a billion light-years from Earth slowly but savagely blends two galaxies into one. Out in the far reaches of the universe, a beautiful, seemingly tranquil scene illuminates the cosmos. But this amazing view of two gas-rich spiral galaxies is, in reality, a violent collision happening in slow motion. This celestial object emits close to 95 percent of its energy in the far-infrared. IRAS 14348-1447 is gas-rich, which means the massive amounts of molecular gas it contains fuels its emission, NASA officials wrote in the image description. The gases undergo many dynamical changes as they connect and travel around each other. This also contributes to the unearthly appearance. Hubble's Advance Camera for Surveys (ACS) captured the scene. The Hubble Space Telescope has been observing the universe since 1990 and is a joint project by NASA and the European Space Agency.